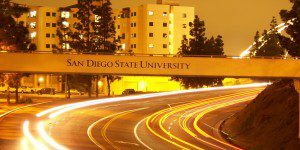 Like the full-time MBA, the San Diego State University (SDSU) part-time MBA consists of 45 units (15 classes), but can be completed in three-to-four years, rather than one-to-two. Classes are scheduled only for evening hours once per week at 4-6:40 p.m. and 7-9:40 p.m., as to accommodate students working full-time. The SDSU part-time MBA curriculum requires 15-21 units of core courses that cover topics such as statistical analysis, marketing, and financial management. In addition, 18 units of electives are required, and 12 of those 18 units can be devoted to a specialization. One business strategy course as well as one culminating experience course–at three units each–are also required. There are currently 228 students enrolled in the SDSU part-time MBA program, 33 percent of which are of minority status, and 10.1 percent of which are of international status. Roughly 54.8 percent of the class is comprised of male students, with 45.2 percent female students. Students are, on average, 29-years old and join the program with a GPA of 3.28 and a GMAT average of 581 (500-700 range). Enrolled students have about 5.6 years of previous work experience. The average cost per semester for SDSU part-time MBA students is $10,742 per year for California residents and $17,870 per year for out-of-state residents. These estimates do not include room, books, or other miscellaneous purchases. Tuition and fees are subject to change. SDSU part-time MBA applicants need to submit transcripts from previous institutions, GMAT or GRE scores, a current résumé, a statement of purpose, two letters of recommendation, and the completed program application. A $55 application fee is also required. The GMAT or GRE may be waived in light of a Ph.D., MD or JD degree only. While work experience is not required to apply, the program does encourage at least two years of it. Non-native English speaking applicants may have to provide either TOEFL or IELTS scores.